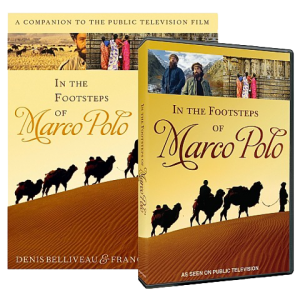 "In the Footsteps of Marco Polo is an armchair explorer’s dream, brimming with stories of exploration and heroic figures. Remarkable adventurers themselves, Francis O’Donnell and Denis Belliveau are uniquely suited to breathe life into one of the greatest expeditions of all time." "This is a classic of travel and exploration. Two young men follow a crazy dream, braving deserts and mountains, hunger and thirst, heat and cold. Death is a close companion, success a miracle of luck and perseverance. The result is a unique pictures-and-text tribute to Marco—and an insight into the deepest, darkest, and most dangerous bits of Europe, the Middle East and Asia. The pictures are wonderful. And it’s also very entertaining." "If anyone ever wanted to go back in time and travel with Marco Polo, this book is the magic portal. Denis Belliveau and Francis O'Donnell are not just fearless travelers, they're highly entertaining guides across the bridge between East and West that Marco Polo first built. Many historians have made a strong case for Polo's accounts but none have actually retraced his exact path, the entire dangerous way and back, to prove that he was there. Fasten your seatbelts—this book is an epic and wild ride". creator of the original Netflix series "Marco Polo"